slippingglimpse is a verbal-visual collaboration between a poet, programmer, and videographer. Each of the ten parts consists of a video of moving water associated with a poetic text that can be conventionally read in split-screen format as it scrolls upwards. (The "scroll text" view enables conventional reading only in the sense that the words are stable and the small window has a verso-recto format; otherwise the layout and lineation invites reading on both the horizontal and vertical axes.) One of the central themes of the poetic text is the materiality of writing and image-producing technologies, ranging from stained glass to C++. This theme echoes the mechanics of the text itself, which in broad terms is algorithmically generated in relation to the movements of the water. Author description:In slippingglimpse, we model a ring in which the roles of initiator, responder, and mediator are taken by all elements in turn. Our mantra for this: water reads text, text reads technology, technology reads water, coming full circle. Reading then comes to mean something different at each stage of the poem, in all cases involving sampling. Ryan reads and captures the image of 'chreods' (dynamic attractors) in water. Strickland's poem text, by sampling, appropriating, and aggregating artists' descriptions of processes of capture, reads this process of capture. And the water reads, via Lawson Jaramillo's motion-capture coding, by imposing its own sampled pattern. A variety of reading experiences are enabled: reading images while watching text; reading in concert with non-human readers, computer and water; reading frame breaks (into scroll or background); or reading by intervening. For instance, reversibility and replay are available on the scroll, as are reading in the direction and speed you wish; while, in the water, regeneration of text is available, as are unpredictable jostling and overlays. Instructions: Choose any image on the title screen to begin. Text in the initial "full-screen" mode may be unreadable, because in this mode language is undergoing physical movement imposed by the 'chreod' pattern of the Atlantic waves. Choose "hi-rez video" to see the structure of the water pattern (chreod) best; or go to "scroll text" to read the text portion of the poem entrained by the water. The poem text can be sped up, slowed down, or reversed by clicking and dragging the pointer. Setting it at 0 stops the text. 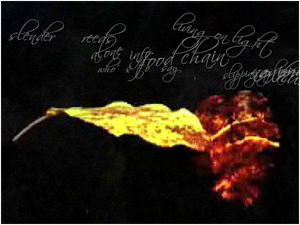 Choosing "regenerate" will restart the video with a new random selection of text chosen from that portion of the poem. Carats (< >)move the readers from one video to the next, or they may choose "home" and select for themselves. slippingglimpse works in browsers with the Adobe Flash player. Previous publication: First published 2007 on its own website, http://slippingglimpse.org, and first shown at e-Poetry 2007 in Paris, this poem has since appeared in hyperrhiz: new media cultures no. 4, 2008, at The Electronic Literature Organization 2008 Media Art Show, at e-Poetry 2009 in Barcelona, and other venues.